High-dose myeloablative hematopoietic cell transplantation is becoming an increasingly common treatment modality for a variety of diseases. Patient survival may be limited by substantial treatment-related toxicities, including chronic kidney disease (CKD). Although the majority of CKD after transplantation is idiopathic, thrombotic microangiopathic syndromes and nephrotic syndrome have been described. Epidemiology, pathogenesis, and potential treatment options for the various clinical syndromes that are associated with CKD in hematopoietic cell transplantation patients is reviewed. As the indications for and the numbers of transplants that are performed worldwide increases, so will the burden of CKD. The nephrologists and oncologists will have to work together to identify patients who are at risk for CKD early to prevent its development and progression to end-stage kidney disease. High-dose myeloablative therapy followed by hematopoietic cell transplantation (HCT) is an increasingly common treatment for many malignancies and some genetic disorders. Approximately 20,000 HCTs now are performed annually worldwide and offer the prospect of cures for otherwise fatal or incurable diseases. The indications and applications for HCT are growing; for example, HCT now is considered for treatment of autoimmune diseases, Crohn’s disease, and vasculitides that are refractory to other therapies (1,2). However, patient survival may be limited by substantial treatment-related toxicities. 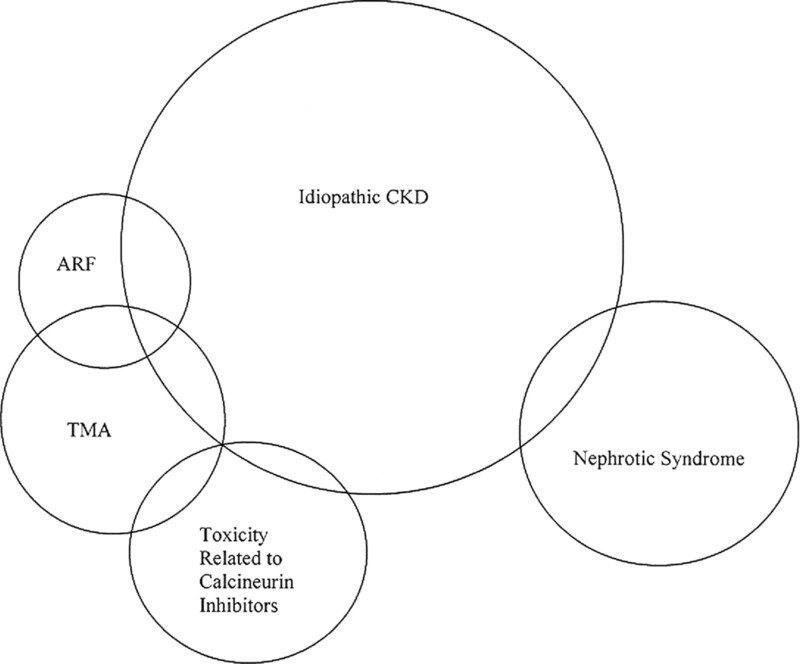 This review focuses on chronic kidney disease (CKD) in survivors of HCT. For the nephrology consultant who deals with transplant survivors, it is important to be aware of the specific type of transplant and its complications to determine how best to treat the patient with renal injury secondary to thrombotic microangiopathy (TMA) syndromes, nephrotic syndrome (NS), persistent acute renal failure (ARF), and idiopathic CKD. Each type of transplant carries its own risks and toxicities (Table 1). Autologous transplants involve the harvesting of a patient’s own bone marrow or peripheral blood stem cells before high-dose myeloablative therapy, followed by re-infusion. Allogeneic transplants use bone marrow or peripheral blood stem cells from family members (ideally, HLA-matched siblings) or HLA-matched unrelated donors or stem cells from umbilical cord blood. Syngeneic transplants are from an identical twin donor. The infusion of stem cells is preceded by either myeloablative therapy (usually a combination of chemotherapy drugs or chemotherapy plus total body irradiation [TBI]) or nonmyeloablative (but immunosuppressive) therapy that allows host hematopoietic cells to coexist with donor stem cells to achieve mixed hematopoietic cell chimerism. The components of both myeloablative and nonmyeloablative conditioning regimens vary from center to center. The most common myeloablative regimens are cyclophosphamide plus TBI 10 to 14 Gy, busulfan plus cyclophosphamide, and busulfan plus fludarabine. Nonmyeloablative regimens contain lower doses of chemotherapy drugs, with or without TBI typically in doses of 200 cGy, plus immunosuppressive drugs (3). Allogeneic graft recipients receive prophylaxis against acute graft-versus-host disease (GVHD) with immunosuppressive drugs, usually cyclosporine or tacrolimus plus methotrexate; mycophenolate mofetil and sirolimus also are used (4). Prophylactic drugs against GVHD typically continue to day 80 after transplantation after myeloablative conditioning regimens but may be tapered earlier than this after nonmyeloablative conditioning to promote a graft-versus-tumor effect. Prophylaxis for infections includes acyclovir for patients who are seropositive for herpes simplex virus, trimethoprim/sulfamethoxazole to prevent Pneumocystic jiroveci infection, oral fluconazole for prophylaxis of candidal infection, and preemptive ganciclovir for cytomegalovirus disease among viremic patients (5–8). Patients who develop acute GVHD (approximately 60% of allograft recipients) are treated with high-dose prednisone (1 to 2 mg/kg per d), often for weeks to months, depending on the clinical response. Patients who fail to respond to prednisone therapy are treated with more intensive immunosuppressive drugs and biologic agents, including anti–T cell antibodies such as anti-thymocyte globulin and mAb such as infliximab or daclizumab, or by adding sirolimus or mycophenolate mofetil to the regimen. Some patients receive extracorporeal photopheresis or phototherapy with direct exposure to ultraviolet A. Such intense immunosuppression frequently is attended by viral, bacterial, and fungal infections, including organisms that specifically can infect the kidney, such as adenovirus and JC/BK polyoma virus. After day 80, allograft recipients are at risk for the development of chronic GVHD, a multiorgan immunologic disorder that often requires prolonged treatment with calcineurin inhibitors and other immunosuppressive drugs. However, in many allograft recipients, tolerance develops, allowing the eventual discontinuation of immunosuppressive drugs and recovery of immunity (9,10). The cumulative incidence of CKD varies from 17.5 to 66% in adult studies (11–13) to as high as 62% in children (14). CKD usually becomes apparent 6 to 12 mo after HCT, although it has been described as early as 2 mo and as late as 10 yr after transplantation. Mortality rates among patients with CKD in this setting are significantly higher than those in transplant recipients who retain normal renal function, even when controlled for comorbidity. Among those who progress to ESRD that requires dialysis, the mortality approaches 90% (15). In most cases of CKD in long-term transplant survivors, the cause is idiopathic. However, several authors have proposed distinct syndromes to describe subsets of patients. For example, Cohen et al. (11) defined the triad of azotemia, hypertension, and anemia that occurs 6 to 12 mo after HCT as “BMT nephropathy.” Some have proposed that the CKD that occurs 6 to 12 mo after HCT is a form of “radiation nephritis,” suggesting that TBI (used in some conditioning regimens before HCT) is the major insult that leads to the subsequent development of kidney disease (16–18). Others have termed the clinical triad described above as “conditioning-associated HUS,” again attributing the renal disease to the conditioning regimen in general but postulating a thrombotic microangiopathy as the proximal cause (19). In this review, bone marrow transplant (BMT) nephropathy, conditioning-associated hemolytic uremic syndrome (HUS), and radiation nephritis are considered under the heading of TMA. NS also has been described after HCT. However, in the majority of patients, CKD is not associated with either TMA or NS and is likely multifactorial in nature. This idiopathic form of CKD after HCT often is defined broadly as an abnormal serum creatinine or GFR at 6 to 12 mo after transplantation (Table 2). The lack of a consistent definition of post-HCT renal disease has made it difficult to draw comparisons across studies, to identify risk factors for its development, and to devise prevention and treatment strategies. The cumulative incidence of ARF, defined as a doubling of baseline serum creatinine within the first 100 d after HCT, varies from 30 to 50% (20,21). The development of ARF in this setting has been associated with portal hypertension and jaundice that is caused by obstruction of liver blood flow (sinusoidal obstruction syndrome), amphotericin use, and lung toxicity (20,22–24). The conditioning regimen of cyclophosphamide and TBI also has been implicated in pediatric studies (21,25). ARF has been shown to be a risk factor for CKD in adult and pediatric cohorts (12,20,26), suggesting that some patients do not recover fully from their ARF and progress to CKD. Chronic GVHD may manifest itself in the kidney as NS with or without renal insufficiency (reviewed in ). Patients usually present with proteinuria, edema, and hypoalbuminemia. The majority of renal biopsies in these case reports showed membranous nephropathy with subepithelial deposits on biopsy; it is postulated that these deposits are antigen/antibody complexes that represent GVHD in the kidney. However, cases of minimal-change disease, which is thought to be a T cell–mediated process, have been described (27). Others have reported cases of diffuse proliferative glomerulonephritis, ANCA-related glomerulonephritis, focal segmental glomerulosclerosis, and IgA nephropathy (28–32) occurring after HCT. The development of each of these diseases seems to be associated with chronic GVHD and/or the tapering of immunosuppression. Treatment with high-dose prednisone and/or re-institution of calcineurin inhibitors usually results in resolution of NS. TMA syndromes represent a spectrum of clinical diseases that are characterized by systemic or intrarenal platelet aggregation, thrombocytopenia, and microvascular fragmentation of erythrocytes. Platelet aggregation can result in ischemia and organ injury. When renal injury is predominant, a diagnosis of HUS usually is rendered, whereas the presence of extensive extrarenal manifestations leads to a diagnosis of thrombotic thrombocytopenic purpura (TTP) (reviewed in ). When the presentation is fulminant, TMA syndromes often are associated with severe ARF and death. More common, they follow an indolent course and result in the eventual development of CKD. TMA syndromes are not uncommon in the setting of HCT. In series of both retrospective and prospective studies, the incidence of microangiopathic disease after HCT ranged between 2 and 21% (34–36). TTP tends to occur early after transplantation, often within the first 90 d, whereas HUS seems to occur much later after transplantation. For the diagnosis of TMA after HCT, the following clinical characteristics must be met: microangiopathic hemolytic anemia demonstrated by red blood cell fragmentation with two or more schistocytes per high-power field, elevated LDH above laboratory baseline, renal dysfunction (defined as a >50% increase in baseline serum creatinine or a 50% decrease in creatinine clearance from baseline) and/or neurologic involvement without other identifiable causes, and negative direct and indirect Coombs tests (37). Severity of TMA is scored, and a new proposal grades severity on the serum creatinine level, need for dialysis, and/or encephalopathy (37). Patients with more severe grades of TMA have a higher risk for mortality (38). Risk Factors for TMA after HCT. No clear relationships have been found for the development of TMA after HCT (Figure 1), although a number of risk factors have been suggested, including age, female gender, allogeneic grafts from unrelated donors, methylprednisolone therapy, T cell depletion, high-intensity conditioning regimens, acute GVHD, and sinusoidal obstruction syndrome (34,36,39,40). TMA also can occur in HCT patients as a result of viral infections or GVHD (41,42). In studies of HUS after transplantation, the primary risk factors identified are TBI (11,14,43,44) and calcineurin inhibitor use (11,19,45–49). Potential risk factors and pathophysiology of thrombotic microangiopathy (TMA) after hematopoietic cell transplantation (HCT). The entity known as “radiation nephritis” was described in the 1920s. The clinical course is variable and manifests as nephritis, hypertension, and proteinuria and/or anemia (50). The time frame for each of these clinical presentations also is variable, with the acute nephritis presenting 6 to 12 mo after irradiation and the subacute, chronic, and late forms occurring 2 to 5 yr later. Although radiation can damage the vascular endothelium, tubular epithelium, and glomerulus, the primary site of injury has not been identified (50,51). On the basis of the dose of radiation received during conditioning therapy for HCT, Miralbell et al. (52) determined the risk for having an abnormal creatinine at 18 mo after transplantation. There seemed to be a dose-dependent relationship between radiation and late renal injury; no evidence was provided that renal injury was related to TMA, however. At a TBI dose of 12 Gy, the relative risk for an elevated creatinine at 18 mo was 2.9, and at a dose of 13.5 Gy, the relative risk was 8.4, compared with the group of patients who received 10 Gy. In a prospective study using renal shielding, a trend toward decreased incidence of CKD was observed in the shielded versus the unshielded groups (44). In this study, all patients received TBI in addition to cytarabine and cyclophosphamide as part of their conditioning regimen. Twenty (13%) of the 157 adults who survived beyond 100 d developed renal insufficiency associated with anemia and hypertension; 18% were from the unshielded group, and 10% were from the single shielded group. No patients who received double shielding (diminishing the total radiation dose to the kidneys to 9.8 Gy) developed renal insufficiency throughout the follow-up period of 2.5 yr. Numerous case reports have described renal injuries associated with various chemotherapeutic regimens with or without TBI. Certain agents may potentiate the effects of radiation. In a study by Lonnerholm et al. (53), carmustine, etoposide, cytarabine, and cyclophosphamide (BEAC) in conjunction with TBI uniformly resulted in renal insufficiency (eight of eight patients who received this regimen developed renal dysfunction) compared with zero of 14 adults who had diagnoses other than lymphoma and received TBI without BEAC. Hebert et al. (54) described a case of a 40-yr-old woman who had Hodgkin’s lymphoma and received two cycles of chemotherapy and then further conditioning chemotherapy before HCT but did not receive TBI. Her regimen was otherwise similar to that described above and included etoposide, cytarabine, and cisplatin. Her serum creatinine before transplantation was 0.9 mg/ml and increased to 4.6 mg/ml 15 mo later. Renal biopsy revealed mesangiolysis, glomerular capillary aneurysms, and widening of the subendothelial space with fibrin deposition, findings consistent with a TMA process. In the absence of TBI, these authors reasonably concluded that the cyclophosphamide and other antineoplastic agents caused the CKD. Drugs such as cyclosporine and tacrolimus can initiate HUS-like syndromes after HCT (11,35,45–49). The manifestations of cyclosporine toxicity range from asymptomatic azotemia and proteinuria to fulminant multiorgan failure (46). On histologic examination of kidneys from three HCT patients who were on cyclosporine and died with renal failure, thrombus formation was observed in capillary tufts and arterioles with subendothelial and mesangial widening and sclerosis. Conversely, none of 55 patients who were not on cyclosporine had renal capillary or arteriolar thromboses (55). Cyclosporine also is a potent vasoconstrictor of the afferent arteriole of the glomerulus. In a small study of seven renal transplant recipients who were on cyclosporine, decreases in GFR and renal plasma flow were found and correlated with cyclosporine dose; the decreases seen were transient and reversed as drug levels returned to trough levels (56). The nephrotoxic effects of cyclosporine correlate with serum levels of the drug and duration of therapy. In addition, cyclosporine is known to cause arteriolar injury, glomerular sclerosis, and interstitial fibrosis as well as diffuse expansion of the mesangial matrix (57). However, the role of cyclosporine as a cause of vascular injury cannot be readily separated from infusion of allogeneic cells (only allograft recipients receive cyclosporine after HCT) or development of acute GVHD. Histopathology of TMA after HCT. Microscopic examination of kidney biopsy specimens from patients with TMA-associated CKD demonstrates mesangiolysis and loss of endothelial cells with expansion of the subendothelium and occlusion of capillary loops. On electron micrographs, there is extensive widening of the space between the glomerular basement membrane and the subendothelium with amorphous deposits that are not immune complexes. Similar findings are seen in patients with BMT nephropathy, conditioning-associated HUS, and radiation nephritis (11,14,16,18,43,58) (Figures 2 and 3). 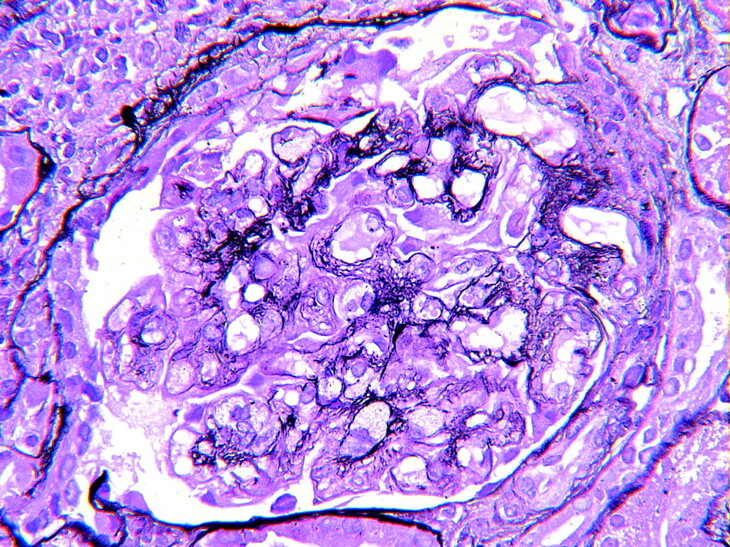 Glomerulus with chronic changes of TMA, irregular thickening, and duplication of capillary loops in a patient with renal insufficiency after HCT. Glomerulus with thrombi formation in a patient with renal insufficiency after HCT. Pathophysiology of TMA in Long-Term Survivors. Regardless of the offending agent, endothelial damage is thought to represent the inciting factor in the development of TMA syndromes. Endothelial injury activates the coagulation system, leading to thrombin formation and fibrin deposition (Figure 1). The ability to repair such injury depends on the balance between fibrinolytic and coagulant activity (59) (reviewed in ). In a mouse model of HCT, aspirin decreased the rate of development of renal injury and diminished the severity of the observed histopathologic lesions, suggesting a role of platelet aggregation after endothelial injury in the pathogenesis of renal disease (60). In a rat model of radiation nephropathy, plasminogen activator inhibitor (PAI-1) expression was increased in glomeruli with evidence of sclerosis, mesangiolysis, and thrombosis. In situ hybridization demonstrated significant association of PAI-1 expression with sites of glomerular injury (61). In humans, PAI-1, a glycoprotein that is produced by endothelial cells, hepatocytes, and platelets, is normally present at low concentrations in plasma. PAI-1 levels are normal in patients without complications after HCT (62); however, there is some evidence that these levels are elevated in post-HCT patients at the time of diagnosis of TTP (63) and also may be elevated in patients with sinusoidal obstruction syndrome and sepsis after HCT. Tissue plasminogen activator antigen remained normal in these patients (64). In children with HUS that was caused by Escherichia coli O157:H7, levels of fragment 1 + 2 (a peptide that is produced when prothrombin is cleaved to generate thrombin) and PAI-1 activity were elevated before the development of HUS (65). These authors concluded that thrombogenesis, fibrin formation, and inhibition of fibrinolysis contributed to the pathogenesis of the renal injury. Finally, the long-term prognosis in patients with HUS that leads to progressive renal scarring is worse when associated with higher levels of PAI-1 (66). Therefore, PAI-1 levels seem to correlate with injury in kidneys. A prospective study of plasma levels of these markers in patients with HCT-related ARF and CKD is under way. Natural History of TMA after HCT. Several studies have been conducted to describe the clinical course of TMA-related kidney injury after HCT, most involving small numbers of patients with relatively short follow-up (1 to 5 yr) (11,14,21,43,67). What is apparent from the studies reported is that often an acute deterioration of renal function is followed by a period of stabilization, but rarely is full renal function restored. Patients with TMA-related CKD after HCT can progress to ESRD and have decreased survival compared with other patients with ESRD (15). Hemorrhagic cystitis is a common complication after HCT. Clinical syndromes vary from microscopic hematuria to macroscopic hematuria, dysuria, and flank pain with or without renal insufficiency. Both BK polyoma virus and adenovirus are known to cause hemorrhagic cystitis after HCT; however, it is not clear whether viremia and viruria lead to renal insufficiency (68,69) (Figure 4). In a report of 21 autopsied transplant patients whose kidneys were infected by adenovirus, 18 had developed ARF (70). Tubules with SV40-positive cell nuclei indicating polyoma virus from kidney biopsy of a patient with renal insufficiency after HCT. Many survivors with CKD after HCT will not present with NS, meet the definition of TMA, or have a documented viral infection and therefore are labeled idiopathic CKD. The incidence of idiopathic CKD varies from 17.5% in patients who receive myeloablative transplants to 66% in patients who have a nonmyeloablative transplant (Table 2). Epidemiologic studies have shown that the major risk factors for idiopathic CKD after myeloablative conditioning regimens are acute and chronic GVHD and ARF, and in nonmyeloablative regimens, additional risk factors for CKD include long-term calcineurin inhibitor use and previous autologous transplant (12,13). TBI seems to play little role in the pathogenesis of idiopathic CKD (12,13). Miralbell et al. (71) found that patients who received a lower dose of TBI because of renal shielding actually had greater decreases in GFR at 4 mo compared with patients who received higher doses of TBI. The effects were no longer apparent out to 12 mo after transplantation. In a cohort study of 142 children who underwent a transplant over a period of 5 yr in The Netherlands, Kist-van Holthe et al. (13) found no correlation between radiation dose used and renal insufficiency at 1 yr. In a large, retrospective study of 1593 HCT patients, TBI, irrespective of dose (range 200 to 1600 cGy), was not associated with the development of CKD after adjustment for demographic data and baseline characteristics, including original diagnosis, donor type, transplant type, and transplant year. In this same study, TBI (hazard ratio 1.0; 95% confidence interval 0.7 to 1.4) was not associated with an increased risk for CKD among patients who received an allogeneic transplant (n = 1228). The finding that GVHD as a risk factor for the development of CKD in patients after HCT that may not present with NS or evidence of a TMA (12,13,52) suggests that either the kidney is a direct target organ of GVHD via T cell–mediated renal damage or that the chronic systemic inflammatory state of GVHD leads to CKD. A third explanation is that chronic exposure to calcineurin inhibitors leads to CKD. These are not mutually exclusive hypotheses as T cell–mediated injury in GVHD is intertwined with cytokine effects (72) and the effects of cyclosporine may be potentiated in the presence of a chronic inflammatory state. The inflammatory and cytokine cascade that accompanies GVHD may affect the kidney without invoking the T cell–mediated injury that is present in GVHD that involves skin, gut, and liver (73,74). Animal Models of GVHD Suggest a Role in the Development of CKD. In a mouse model of GVHD in which the kidneys were examined, venulitis, endothelialitis, and tubulitis were present as early as 2 wk after transplantation. This lymphocytic inflammatory process then progressed, and by 6 mo, more severe endothelialitis and venulitis were present along with an increased number of peritubular infiltrates (75). The authors suggested that these findings represent a continuous process of tissue injury that is different from the early injury that is seen in other target organs of GVHD (75). This may explain why CKD often occurs beyond the first 3 mo after transplantation. In other animal models of GVHD, investigators demonstrated that the tissue destruction of acute GVHD does not require alloantigen expression on target epithelium for cellular cytotoxicity but can be mediated by inflammatory cytokines (76). Human Investigations into Pathogenesis of Idiopathic CKD. In an autopsy study of renal pathology in 26 autologous and allogeneic hematopoietic cell transplant patients, renal tubulitis that was identical to that seen in renal allograft rejection was present in 67% of patients (77). In a case report of minimal-change NS after HCT, large numbers of CD8+ donor T cells were found infiltrating the interstitium and periglomerular areas of the kidney (78). In support of the hypothesis that the inflammatory and cytokine cascade that accompanies GVHD can affect the kidney, several studies have demonstrated that elevations in plasma cytokine levels correlated with development of posttransplantation complications and organ dysfunction in the HCT population (79,80). In a case report of minimal-change NS after HCT, increased production by donor T cells of TNF-α and IFN-γ were related to the development of NS; the lack of cellular infiltrates on biopsy suggested that the glomerular injury was secondary to cytokine production that was stimulated by alloantigens at extrarenal sites (80). In addition to the T cell activation and cytokine release in acute GVHD, chronic GVHD involves the activation of B cells and production of cytokines, including TGF-β1 (81). TGF-β1 is important for collagen synthesis and matrix deposition in the kidney and other organs (82,83) and also may be important in the development of cyclosporine nephropathy in nonrenal transplant patients (84). The effects of cyclosporine on the kidney can be potentiated by increases in the production of TGF-β (85). Endothelial injury has been described in patients with chronic GVHD, and it is thought that endothelial cells are direct targets of cytotoxic donor T lymphocytes in these patients (86). On the basis of recent multivariable analyses of putative risk factors in a large cohort of patients, I am skeptical that TMA and TBI are major causes of renal injury in long-term transplant survivors. CKD seems to be caused by a combination of factors, including GVHD and the chronic inflammatory state that accompanies it, and medications that are used for treatment of GVHD. These patients warrant a biopsy so that we can better understand the pathophysiology of CKD and the role of GVHD and chronic inflammation in the development and progression of CKD. Although the described pathology of the kidney in selected patients with CKD after HCT has demonstrated microangiopathic changes or changes associated with NS, the pathophysiology of idiopathic CKD after HCT in individual patients often is obscure. The problem is that patients with CKD after HCT often are not considered candidates for biopsy because of the perceived risks of the procedure in this patient population. Therapeutic options for the treatment of TMA after HCT are limited. Case series of plasma exchange have been described with mixed results (87,88). Potential offending agents such as cyclosporine and tacrolimus have been discontinued with some improvement clinically, but, again, response depends on the severity of disease. However, on the basis of treatments that are used in animal models, primarily of radiation-induced HUS, there are potential interventions for patients with HUS after HCT. Angiotensin-converting enzyme inhibitors (ACEI) have been used in rodent models of HCT-related renal injury with positive results. The use of captopril or enalapril at the time of TBI in these animals resulted in less azotemia, lower BP, and long-term preservation of renal function (89). In addition, when it did occur, the onset of renal dysfunction was delayed and there was a decrease in proteinuria. Studies that have used ACEI in combination with dexamethasone (90) or ACEI with hydrochlorothiazide (91) or an angiotensin receptor blocker (ARB) had similar results. There was greater preservation of renal function with the ACEI and dexamethasone in combination, supporting the contributory role of inflammation in the process. Moreover, diuretics did not confer the same degree of protection, suggesting that it is not merely control of BP that improved outcome. In a rat model of radiation nephritis, ACEI markedly reduced glomerular lesions and sclerosis and attenuated the increased levels of PAI-1 mRNA expression that was seen in irradiated kidneys compared with the untreated group (61). Therefore, a potential mechanism through which ACEI potentially can benefit patients who develop HUS after HCT is by preventing thrombi formation and sclerosis by inhibiting PAI-1 activity. However, these mouse models were of radiation-induced injury, and because it is likely that TBI is not playing a role in idiopathic CKD, it may be that the potential beneficial effects of ACEI and ARB in these patients are due to reduction of BP as well as inflammation and inflammatory markers (92). Randomized, controlled trials using ACEI or ARB in people who have undergone HCT have not yet been published. There have been case series of patients who underwent renal transplantation successfully after HCT (93–95). In patients who received their kidney from the same donor as their stem cells, little or no immunosuppression is required. There clearly are distinct clinical entities that occur after HCT; TMA, NS, and idiopathic CKD account for almost all cases (Figure 5). The potentially independent role of GVHD, chronic inflammation, and chronic exposure to calcineurin inhibitors in the development and progression of idiopathic CKD warrants further investigation. Approximately 80% of HCT patients develop microalbuminuria by day 100 after transplantation; it is not clear whether microalbuminuria is a marker of incipient nephropathy in these patients or simply a marker of endothelial dysfunction (S.H., unpublished data). Given the risks that are involved in renal biopsy after HCT, identification of urinary markers of both acute and CKD using proteomic techniques may be relevant for diagnosis and management. Conceptual framework for viewing chronic kidney disease (CKD) in long-term survivors of HCT. ARF, acute renal failure. CKD after HCT is a relatively common occurrence. As the indications for and number of transplants that are performed worldwide increase, so will the burden of kidney disease. Identifying patients who are at risk for the development of CKD will be important for prevention of CKD and progression to ESRD in this patient population. Until the pathogenesis of CKD in those who currently are labeled idiopathic is clarified, the most effective strategies to prevent renal injury in long-term survivors will remain empirical. The burden of management will fall on both nephrologists and oncologists to ensure close monitoring of renal function, BP, and urinalyses after transplantation. Renal biopsies should be encouraged, because clinical-histologic correlations are needed to better understand the pathogenesis of CKD in this population. S.H. is supported by the following grants: K23 NIH DK 63038 from the National Institute of Diabetes and Digestive and Kidney Disease, National Institutes of Health; American Society of Nephrology/Renal Physicians Association Health Scholars Grant; and the National Kidney Foundation Young Investigators Grant. I thank Dr. George McDonald for review of this manuscript. The pathology photographs were kindly provided by Dr. Erika Bracamonte, renal pathology fellow at the University of Washington School of Medicine, Department of Pathology. This Disease of the Month article reviews clinical and therapeutic considerations for nephrologists called upon to manage the renal problems that accompany the increasingly common procedure of hematopoeitic cell transplantation. This article is extended by a Mini-Review in the accompanying issue of CJASN that specifically addresses the problem of nephrotic syndrome in such patients (Brukamp et al., pages 685–694).